I can only say to you as I do to the many young writers who ask for advice—There is no easy road to successful authorship; it has to be earned by long & patient labor, many disappointments, uncertainties & trials. Success is often a lucky accident, coming to those who may not deserve it, while others who do have to wait & hope till they have earned it. This is the best sort & the most enduring. I worked for twenty years poorly paid, little known, & quite without any ambition but to eke out a living, as I chose to support myself & began to do it at sixteen. This long drill was of use, & when I wrote Hospital Sketches by the beds of my soldier boys in the shape of letters home I had no idea that I was taking the first step toward what is called fame. It nearly cost my life but I discovered the secret of winning the ear & touching the heart of the public by simply telling the comic & pathetic incidents of life. Little Women was written when I was ill, & to prove that I could not write books for girls. The publisher thought it flat, so did I, & neither hoped much for or from it. We found out our mistake, & since then, though I do not enjoy writing “moral tales” for the young, I do it because it pays well. But the success I value most was making my dear mother happy in her last years & taking care of my family. The rest soon grows wearisome & seems very poor beside the comfort of being an earthly Providence to those we love. I hope you will win this joy at least, & think you will, for you seem to have got on well so far, & the stories are better than many sent me. I like the short one best. Lively tales of home-life or children go well, & the Youth’s Companion is a good paying paper. I do not like Loring as he is neither honest nor polite. I have had dealings with him & know. Try Roberts Brothers 299 Washington St. They are very kind & just & if the book suits will give it a fair chance. With best wishes for a prosperous & happy New Year I am your friend. If Miss Churchill was expecting any discourse on how wonderful writing is, she was disappointed. But I love Alcott’s practical take: write what makes you money, because that’s how you’ll be able to provide for your family. It’s also notable that Alcott gives direct publishing advice, even an address. 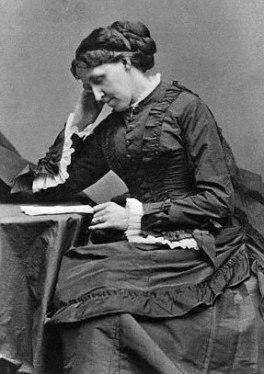 As far as Loring goes, this is most likely A. K. Loring, who published Alcott’s Moods in 1865, and then reissued it in 1870 after Little Women became a hit. And now I suppose I’ll have to go seek out their correspondence to see just how impolite he was. It should no longer surprise me, but this scenario seems to have changed little over the decades. I do wonder about writing from a purely practical point, as Miss Alcott advises, when the creative gene drives so many of us, always aspiring to that wonderful level of success, but we write on...and on, sometimes the only one with faith in our work. Thank you for this very interesting letter, Ken!